Thirty-eight years ago, in 1980, our parents decided to make a big change in their lives, leave Athens behind and return to Tinos, their homeland. There, they created the “Noufara” pastry shop, which started as a business partnership, but as the years passed by, it became a family-owned business. 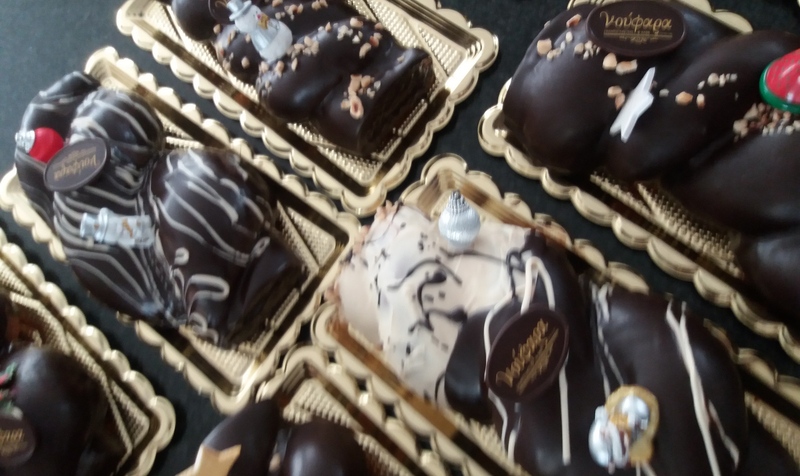 The contribution of our father’s long working experience in some of the best confectioneries in Athens (Serafeidis, Toulipa, Delis, King’s Palace Hotel, etc.) and our mother’s discreet assistance has always been great. This shop has now been passed on to us, though our parents are always present, supporting our endeavor. During these 38 years, our simple pastry shop gradually came to be a beautiful café. It is located in one of the most picturesque alleys of the island of Tinos, in Taxiarchon Square & Kontogeorgi str., just 100m from the main harbor of our island. You can visit it to enjoy coffee accompanied by delicious pastries. 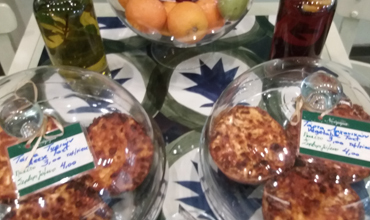 In both our shops, you can enjoy traditional Tinian sweets, like almond marzipan sweets, “psarakia”, sweet cheese pies or “tsimbites”, “xerotigana”, brittle, Greek delights or “loukoumia” and more. 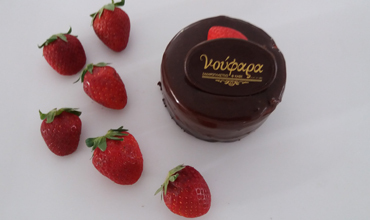 You will discover a great variety of cakes, homemade ice-creams, syrup sweets and cookies, together with our clients’ favorites, such as profiterole, chocolate cake, Valrhona chocolate cake and many more. Also, we have a great selection of excellent choices for weddings, christenings, parties and every other event type. In our pastry shop, you will delight in the sense of hospitality, consistent quality and great service, while savoring sweets made with pure ingredients, fresh recipes that reinvent traditional confectionery and all-time classic flavors with a taste of home now fused with new ingredients and ideas. We dare and prompt everyone visiting Tinos for the first time to leave any preconceived notions they might have formed about it behind as soon as they disembark from the ship. Instead, they should spend some time wandering around, exploring it, perceiving it through their own eyes, and not based on what they have heard about it, as it is really worth it. And, of course, visitors should never visit Tinos while on a diet. But if they do, they should always allow themselves some leeway to taste local traditional savory or sweet delicacies, and believe us when we say that they are unique! Let yourselves be enchanted by both!